Currently, Lake Havasu is experiencing a seller's market. Inventory remains low. But buyer demand is high. Prices continue to rise. So, if you're thinking about putting your Havasu home on the market, now's a great time to do so. If you think your home might go above asking or you would like to spark a bidding war, there are a few "under-the-radar" things you can do to that may potentially help you receive over asking for your home. Want to receive over asking for your Havasu home? Try listing it lower than others in the area. Homes listed anywhere between 5 and 10% below market value typically receive a higher amount of traffic. Buyers want a bargain. 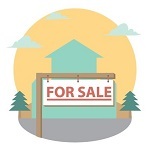 More traffic brings the potential for more offers on your home. In turn, that could boost your final sale price to higher than you initially thought. It might be tempting to simply accept the first offer you receive on your Havasu home. But, take a breath. Instead, use the offer as a starting point. 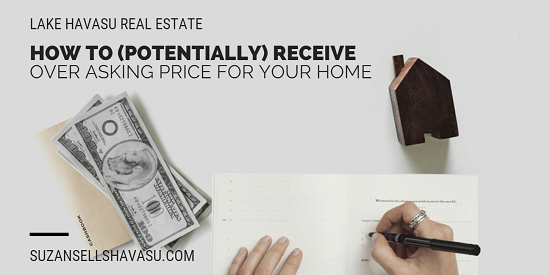 With this offer firmly in hand, your Lake Havasu real estate agent can use it to create a sense of urgency with other potential buyers. When a buyer knows there's another offer on the table, they're more likely to want to outbid the offer by submitting a higher one. You don't necessarily have to spend a fortune to stand out in a crowd. Increasing your curb appeal goes miles towards receiving over asking price for your Havasu home. Add some paint to the exterior. Paint the front door a bold color. Clear out the clutter inside. Update light fixtures. Repaint the kitchen cabinets and add pulls or knobs for a totally transformative look with little effort. Sure, you'll probably need to spend some money to get these chores done, but they'll be well worth the investment when you receive over asking price. Do you live in the most desirable neighborhood in town? Have you updated your house to include several smart home features? Is your swimming pool "state-of-the-art"? Is your garage air conditioned? Make sure your real estate agent highlights these features to potential buyers. If they are worthy of the praise, they could bring in a higher sale price. A couple of these "under-the-radar" moves to try to get over asking price for your Havasu home may come with some risk. Discuss your options with your real estate agent to decide whether they're right for you. They understand the current state of the market and should be able to advise you whether underpricing or waiting for other offers is the right way to go.